Ready to upgrade your Facebook business account? Social media has emerged as the ultimate solution for almost any digital marketing strategy. With the right set of social profiles, you can do so much more than just advertise your business. These platforms give companies the opportunity to connect with their target audience on a deeper level, build thought leadership, earn credibility and strengthen brand loyalty. So, why restrict yourself to just one account? While there are plenty of social platforms that work well together, Facebook and Instagram are a match made in heaven. After all, Facebook purchased Instagram for almost $1 billion around 7 years ago. Because the two channels are naturally intertwined, you can share the images you take on Instagram directly to your Facebook business news feed, with no need for any additional apps. So, how do you connect your Facebook business account to your Instagram profile? Why Link Your Facebook Business and Instagram Accounts? Before we cover “how” you can link Facebook business and Instagram, let’s tackle a more pressing question: why should you bother? The easy answer is that linking Facebook and Instagram is one of the best ways to enhance your social media strategy. Linking your Instagram and Facebook business accounts allows you to post the pictures, stories, and even videos on your Instagram account directly through Facebook. Not only will this give you more compelling content to share on Facebook, but it will also increase your chances of likes and engagement for your Instagram content at the same time. Although Instagram is growing in popularity, with 1 billion monthly active users present on the app in 2018, Facebook is still the biggest social platform in the world. The more potential followers and fans you can access by linking your pictures to Facebook, the greater your chances of succeeding on Instagram. Since the recent Instagram algorithm prioritizes the posts with the highest engagement levels, the extra likes that you get from your Facebook followers are useful. They could mean that your content starts to rank higher in the daily newsfeed too, giving you greater access to new followers, influencers and brand advocates. Combine all of those benefits with the fact that the seamless integration between Facebook business and Instagram makes connecting your accounts simple, and there’s no reason not to get started. 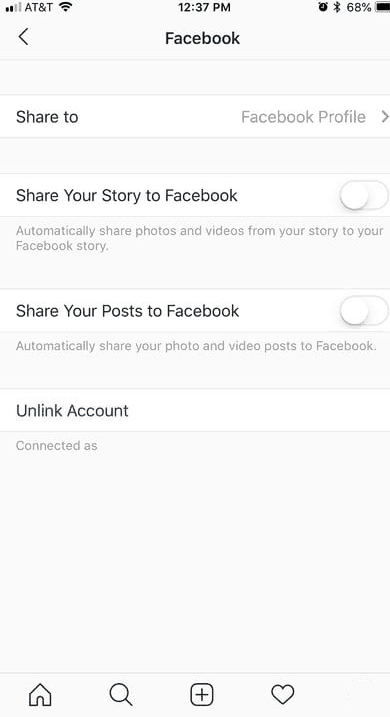 All of your Instagram post details will share naturally to Facebook. The shares are also complete with hashtags, location data, and any emojis you use too. It’s an easy-peasy way to grow your online business. You can even tag influencers that will help you to cross-promote your content. Now that we’ve covered why you should link your Instagram and Facebook business accounts let’s get down to the basics on how to do it. The process for connecting the two channels is identical on both Android and iOS. However, keep in mind that the process is only possible via your smartphone app. To get started, tap on the “Settings” icon at the top right-hand side of your screen. This will take you into your Options page, where you can work on various preferences, including your social sharing settings. Scroll down through the page until you reach the section titled Linked Accounts. You’ll find this section under the Privacy and Security part of your account. Once you click in, you’ll see a list of social platforms open to Instagram integration, including Facebook. Tap on the Facebook business option and sign in with your log-in credentials. With your details entered, you’ll be asked to confirm that you’re signing in as yourself. From there, you’re ready to go! Your accounts are connected. Now you don’t have to do anything to simultaneously share content on Facebook business and Instagram. Told you it was simpler than you thought! If you want to share a picture on Facebook that you’ve already posted on Instagram, that’s easy too. Go to the image that you want to share on your Instagram profile and tap on the ellipses in the top right corner. Here, you’ll be able to touch the Share option in the menu and toggle the slider on besides Facebook. Tap the Share button again to post your photo on Facebook. If you want to stop sharing your content on Facebook and Instagram simultaneously, then you can always change your account settings. Remember, both Instagram and Facebook business give account holders more control over their data. 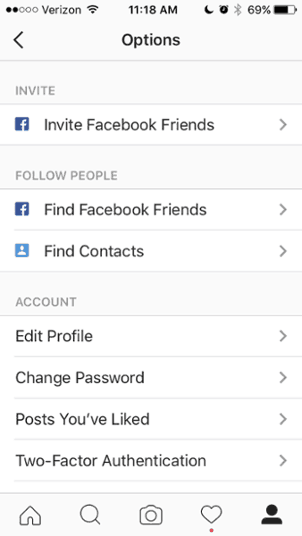 To cancel the connection between your two profiles, head to the Linked Accounts menu again and tap on the Facebook option. This will toggle the slider off again, and that means that you’ll no longer be sharing pictures on both accounts. The next page also gives you further options regarding your account. This is where you can decide whether you want your posts to automatically share to Facebook. To remove your account completely tap the Unlink Account option then hit confirm. Importantly, there are a few rules that you should keep in mind if you decide to cross-promote your social profiles on Facebook business and Instagram. First of all, you might have noticed that we’ve been talking about linking your Facebook business account here, and not your personal account. While it is possible to link personal and business accounts, we’d recommend against doing that. You’d need to constantly toggle back and forth between various accounts and identities. There are plenty of examples out there of companies that have had a hard-time multi-tasking on social media. The last thing you want to do is get a bad reputation because you post a personal comment or photo on a business account. It’s crucial to make sure that you’re following the terms and conditions for the posts that you publish on Facebook and Instagram. If you’re not sure of the rules, make sure that you give them a quick read now. That way, you’re more likely to avoid a shadow ban. Should You Link Facebook Business and Instagram? Cross-promoting on social media accounts isn’t the right idea for every company. However, it is a good way to boost your chances of a bigger online following. Around 73% of brands publish around one photo a week on Instagram. So, it’s safe to say that the platform is gaining traction as a business tool. With a connected Facebook business and Instagram account, you’ll be able to improve your visual marketing strategy. You can also promote your image and brand in multiple environments, and enhance your credibility. You might even find that connecting your accounts helps to boost your reputation. Or you could improve your chances of earning Instagram verification – a highly sought-after thing for any growing company. Just remember that if you do decide to link your Facebook and Instagram accounts, the rules of Instagram success don’t change. You’ll still need to post plenty of relevant, entertaining and inspiring content.